Decorative electroplating assuming secondary current distribution with full Butler-Volmer kinetics for both the anode and the cathode. The deposited thickness on the front and the backside of the piece is shown. 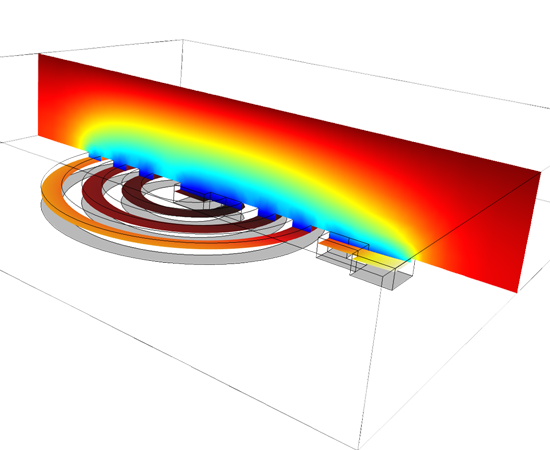 Modeling and simulations are cost-effective methods for understanding, optimizing, and controlling electrodeposition processes. 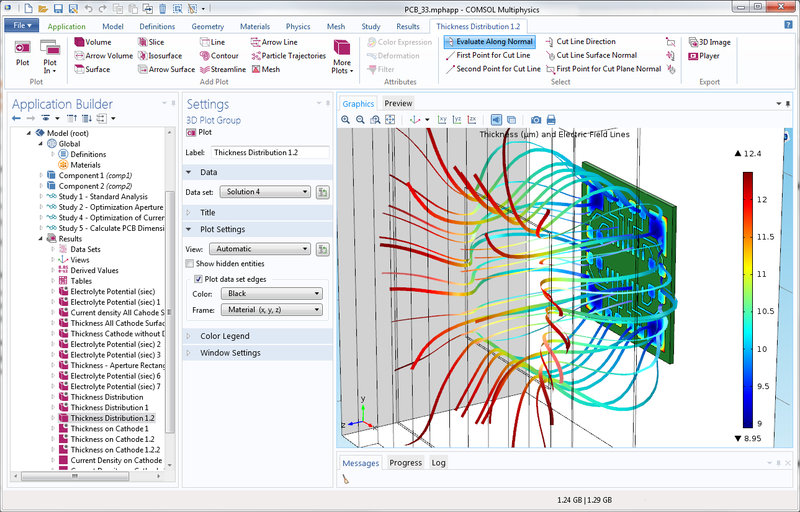 A typical simulation yields the current distribution at the surface of the electrodes, and the thickness and composition of the deposited layer. Simulations are used for studying important parameters such as cell geometry, electrolyte composition, electrode reaction kinetics, operating voltages and currents, as well as temperature effects. With information about these parameters, you can optimize the operating conditions of the electrochemical cells and the placement and design of masks, and ensure the quality of your surfaces, while minimizing material and energy losses. The Electrodeposition Module is suited for a wide variety of applications, including: metal deposition for electronics and electrical parts; corrosion and wear protection; decorative electroplating; electroforming of parts with thin and complex structures; etching; electromachining; electrowinning; and electrorefining. With the Electrodeposition Module, you can consider all of the participating phenomena and simulate them together. More specifically, you may couple the equations that describe current transport and conservation, chemical species transport, charge balances, and electrochemical kinetics. Due to the ability to account for several relevant phenomena, you are able to obtain accurate estimates of the quality, shape, and thickness of the deposit on the surface of the electrodes. Tools and physics interfaces are available within the Electrodeposition Module for defining the physical characteristics of your process. Predefined formulations allow you to model primary, secondary, and tertiary current distribution effects – often excellent indicators of the surface finish and product quality of your process. The effects of a moving boundary in the application of copper electrodeposition on circuit boards. The model is time-dependent and results clearly show that the mouth of the trench narrows, due to the non-uniform deposition of the copper. Deposition on an inductor coil that includes using an isolating photoresist mask, and a diffusion layer on top of the photoresist. The mass transfer of copper ions in the electrolyte has a major impact on the deposition kinetics, resulting in higher deposition rates in the outer parts of the deposition pattern. Primary, secondary and tertiary current distributions in a rotating cylinder Hull cell. Model of the electroplating of a Printed Circuit Board (PCB). The results show the electric field lines and the thickness of the plated copper circuits in the PCB. The Application Builder is used to build apps than can be used to simulate the same properties, without requiring extensive knowledge of simulation. 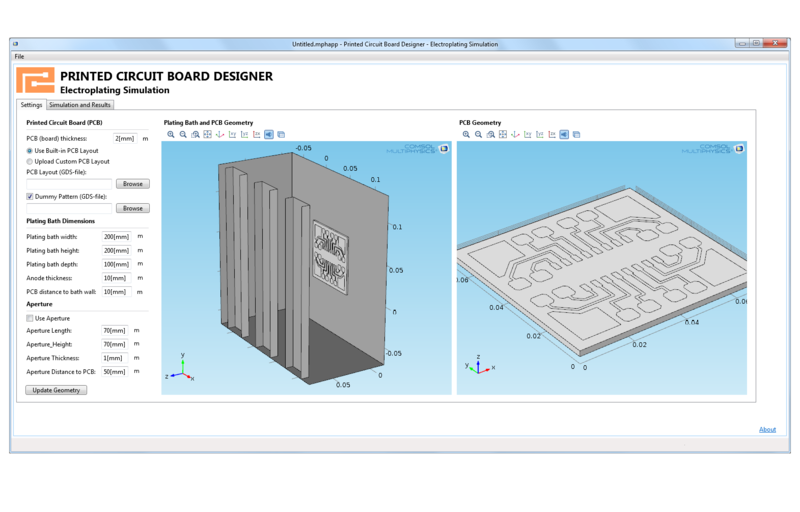 A COMSOL Application built from a COMSOL Model of the electroplating of a Printed Circuit Board (PCB). The results show the electric field lines and the thickness of the plated copper circuits in the PCB. The app can study the thickness and uniformity of the copper circuits in the Printed Circuit Board (PCB) for different parameters such as plating rate, layout and bath setup. The app can also be used for finding the optimum deposition rate for a give uniformity target as well as finding the optimum design of the aperture (protective shield) placed between the anode and the PCB. 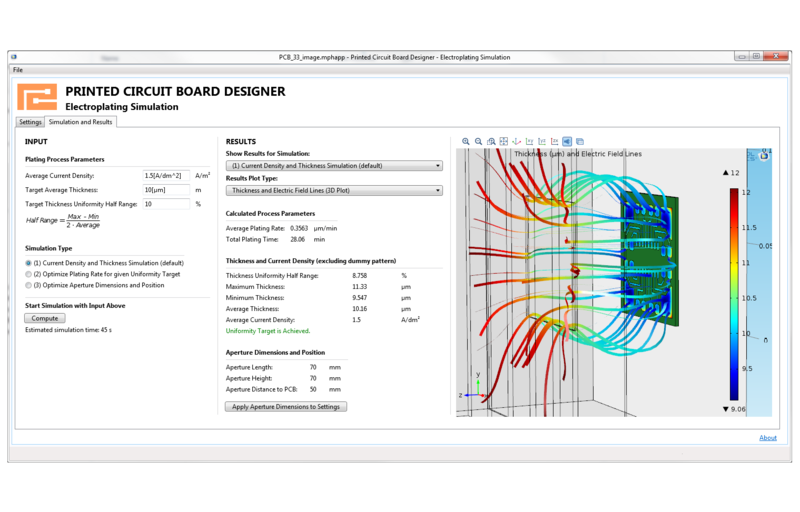 The Settings features from a COMSOL Application built from a COMSOL Model of the electroplating of a Printed Circuit Board (PCB). Built into the app is the ability to manipulate a number of the different bath and aperture geometric dimensions, as well as to upload your own design. This allows you to study the thickness and uniformity of the copper circuits in the Printed Circuit Board (PCB) for different parameters such as plating rate, layout and bath setup. The app can also be used for finding the optimum deposition rate for a give uniformity target as well as finding the optimum design of the aperture (protective shield) placed between the anode and the PCB. As with all chemical processes, you can study many of the effects of your electrodeposition processes at different scales, depending on your purpose. On the microscale level, this could mean investigating the electrochemical kinetics of the participating reactions and the influence of different levelers or striking conditions on the kinetics of electrodeposition. At the counter electrodes, a careful selection of electrocatalyst and electrode micro structure may be required, especially for electrowinning where you need to minimize losses. Simulating these processes and comparing them to experiments or data from your process will allow you to understand the charge transfer reaction mechanism at the electrode surfaces, and derive the electrochemical kinetics parameters, like the exchange current densities and the charge transfer coefficients for each reaction. By knowing these mechanisms and parameters, you can simulate the rate and distribution of deposition or etching at a larger scale. Simultaneously, you will be accounting for the operating conditions of the system, such as cell and electrode geometry, cell voltage or imposed current, masking and shielding, electrolyte composition and flow, gas evolution, and temperature. The standardized COMSOL Desktop® user interface, which is the basis for the Electrodeposition Module, is also used for all the other add-on products in the COMSOL Product Suite. 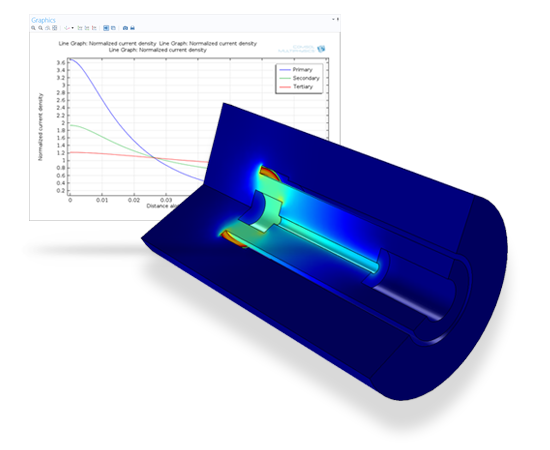 This enables you to couple the physics describing your electrodeposition or etching process to other modules, such as the Heat Transfer Module for studying thermal effects, or the CFD Module for understanding the effects of two-phase flow. Moreover, other physical characteristics, like structural integrity for example, can be modeled sharing the same model files that you used to model your electrochemical cell. This unified modeling platform is the perfect tool for collaborating with engineers working on the same process across different fields. You can define electrochemical charge transfer reactions where the kinetics expressions can be arbitrary functions of the modeled variables. Examples of these include chemical species concentration, local electrode and electrolyte potential at the electrode-electrolyte interface, and temperature. In the Secondary and Tertiary Current Distribution interfaces, you can also enter parameters for the electrode kinetics, such as exchange current density, anodic and cathodic charge transfer coefficients, stoichiometry, and equilibrium potential for the electrode reactions in your system. Predefined expressions are also available for Butler-Volmer and Tafel expressions. Moreover, you may add several competing reactions on a single electrode surface, for instance add hydrogen evolution at the plating electrode. In the case of tertiary current distribution, you can couple the electrode reactions to the local concentration of the electroactive species in the electrode kinetics expressions by using the variables for the concentration. Concentration overpotential may also be estimated by using Nernst equations for the contribution of the concentration overpotential. Interfaces for modeling laminar and porous media flow are also available in the Electrodeposition Module, through Navier-Stokes, Darcy's Law, and the Brinkman equations. Turbulent and two-phase flow may be considered by coupling appropriate physics interfaces from the CFD Module to your simulations. The Electrodeposition Module is further equipped with support for including the effects of geometric changes to the electrochemical process by modeling moving boundaries as the deposited layer grows in thickness at the cathode. 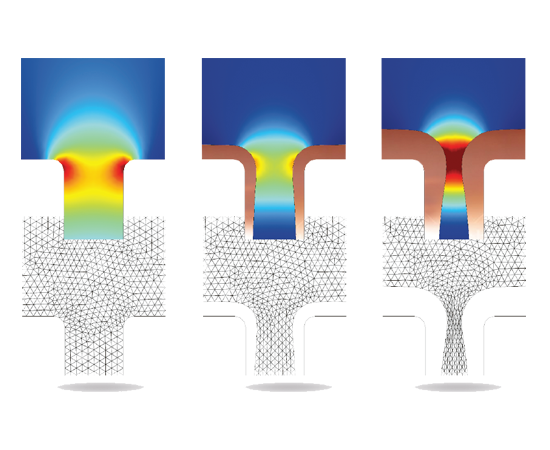 Receding or growing surfaces can significantly affect the operation of your cell, and the Electrodeposition Module dynamically considers these changes as part of your simulation. In addition, for the cases where the deposited metal layer or anode thickness variations are small, you can also select a physics interface that keeps track of the plated layer thickness, and how this may influence ohmic effects in the electrode, without actually changing the geometry. Instead, a variable for the thickness is introduced that also affects the local electrical conductance of the electrode. The changes in thickness of the electrode can be automatically calculated from the electrode kinetic expressions by defining the stoichiometry coefficients, the molar mass, and the density of the deposited or consumed metal for the electrode reactions. The descriptions of ion transport in the electrolyte and the electron conduction in the electrodes, in combination with the conservation of current and charge, form the backbone of the Electrodeposition Module. In the Primary and Secondary Current Distribution interfaces, ion transport in the electrolyte is assumed to take place through migration of ions, neglecting the influence of diffusion. This is useful when mixing in the electrolyte is good enough to nearly eliminate concentration gradients. Secondary current distribution formulations may also be used when you only have concentration gradients close to the electrode surface, by using analytical expressions for the concentration variations across the boundary layer at the electrode surface. In the Tertiary Current Distribution interfaces, the transport of ions in the electrolyte is described using diffusion, convection, and migration (Nernst-Planck equations). The current density is automatically evaluated by the module through adding all contributions from the transport of ions to the current density. Thus, the current density is described by diffusion and migration of ions, which is required when substantial concentration variations are present in the electrolyte. The current balance in the electrodes is fully coupled to the current balance in the electrolyte at the electrode surfaces through the electrode reaction kinetics. Ohm's law describes the conduction of current in the electrodes. The Electrodeposition Module also contains an interface for modeling current transfer through thin metallic structures or shells, for example to model the strike in the beginning of the plating process. This allows you to model thin electrodeposited layers on non-conductive structures together with current balances in the electrolyte accounting for ohmic losses in the electrodes. The Electrodeposition Module models the transport of chemical species through diffusion, convection, and migration in dilute and concentrated solutions. The module includes a predefined Nernst-Planck Equations interface, but migration is also added by the module to the Chemical Species Transport interfaces in dilute and concentrated solution, as well as in porous media. Convection, conduction, and Joule heating can all be modeled when you have the Electrodeposition Module, which contains a specific physics interface for heat transfer through porous media. The module adds contributions from electrochemical processes to the heat balance. For example, it adds the losses due to activation overpotential as heat sources at the electrode boundaries. This is a model of the secondary current distribution in a zinc electrowinning cell. The model investigates the impact on the current distribution when changing the electrode alignment in a parametric study. The geometry is in 2D. Tutorial model of electroplating. The model uses secondary current distribution with full Butler-Volmer kinetics for both anode and cathode. The thickness of the deposited layer at the cathode is computed as well as the pattern caused by dissolution of the anode surface.